Acute pericarditis is an inflammatory process involving the pericardium that results in a clinical syndrome characterized by chest pain, pericardial friction rub, changes in the electrocardiogram (ECG) and occasionally, a pericardial effusion.2 Generally, the diagnosis requires 2 of these 3 features. Acute pericarditis is the admitting diagnosis in 0.1% of hospital admissions and 5% of admissions with chest pain. It occurs more commonly in men than in women. The most common form of acute pericarditis is idiopathic, which accounts for about 90% of cases (Box 1). Other common causes include infection, renal failure, myocardial infarction (MI), post-cardiac injury syndrome, malignancy, radiation, and trauma.1 These are discussed in more detail later. Acute pericarditis typically presents with acute onset severe, sharp retrosternal chest pain, often radiating to the neck, shoulders, or back. Positional changes are characteristic with worsening of the pain in the supine position and with inspiration; and improvement with sitting upright and leaning forward. The cause of acute pericarditis is often difficult to establish, and idiopathic pericarditis remains the most common diagnosis. Most cases are presumed to have a viral etiology. Coxsackievirus B and echovirus are the most common viruses, and a fourfold increase in antiviral titers is required for the diagnosis. Patients often experience a prodrome of an upper respiratory tract infection. The prognosis of viral pericarditis is generally good, with a self-limited course, and if uncomplicated, patients may be treated on an outpatient basis. Before the antibiotic era, pneumonia was the prime cause of purulent pericarditis. Currently, causes include thoracic surgery, chemotherapy, immunosuppression, and hemodialysis, as well as extension from pneumonia and empyema. Presentation is usually acute with high fevers, chills, night sweats, and dyspnea, but the classic findings of chest pain or friction rub are rare. Cardiac tamponade is common (42% to 77% of patients in selected series), and mortality is high. 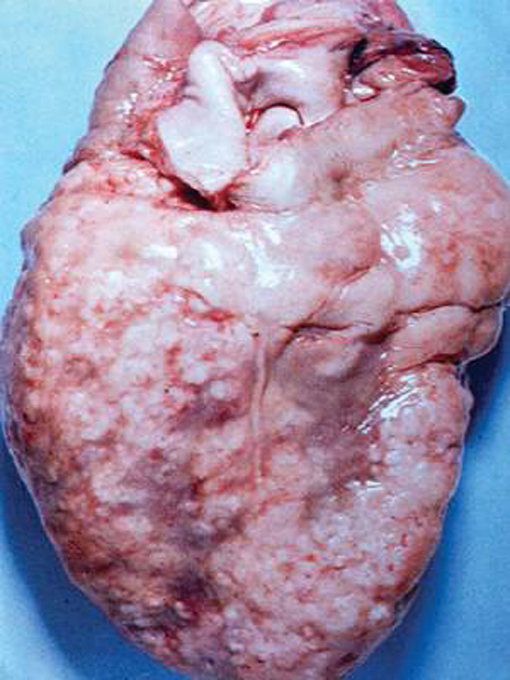 Tuberculous pericarditis occurs in 1% to 2% of cases of pulmonary tuberculosis. It remains the leading cause of pericarditis in some developing countries. Immunocompromised or human immunodeficiency virus (HIV)‑positive patients are at increased risk.4 Nonspecific symptoms such as dyspnea, fever, chills, and night sweats develop slowly, and a friction rub or chest pain is often absent. A patient with suspected or diagnosed pericardial tuberculosis should be hospitalized and antituberculous therapy started promptly. Analysis of the pericardial fluid shows high specific gravity, very high protein level (often >6 g/dL), and predominantly lymphocytic cells. A pericardial biopsy with acid-fast bacilli polymerase chain reaction testing is recommended for all patients with suspected tuberculous pericarditis. However, a normal pericardial biopsy does not exclude the diagnosis. Recent or remote mediastinal radiation can cause pericarditis at any time from weeks to months after the exposure. Sharp or blunt trauma (Figures 4 and 5) and invasive cardiac procedures such as electrophysiological ablation procedures, cardiac diagnostic, or interventional catheterization have been associated with pericardial irritation and inflammation. Testing should include a complete blood count, markers of inflammation including erythrocyte sedimentation rate and/or C-reactive protein, markers of myocardial ischemia (troponins/CK-MB) to assess for myopericarditis, and assessment of renal function. Depending on presentation and clinical evaluation, additional blood testing may be necessary such as viral titers, blood cultures, thyroid-stimulating hormone, antinuclear antibodies, HIV serology, or QuantiFERON-TB assay. 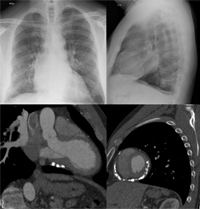 The chest radiograph may be entirely normal unless there is a pericardial effusion causing cardiomegaly (Figure 7A-B) or there are changes caused by an underlying disease. Trans-thoracic echocardiography (TTE) is used to detect and evaluate for pericardial effusion and any concomitant cardiac disease. Assessment of regional wall motion abnormalities can help differentiate acute pericarditis from myocardial ischemia. Echocardiography is essential in the presence of hemodynamic abnormalities, history of recent cardiac surgery, or if there is a clinical suspicion of a large or increasing pericardial effusion. In acute idiopathic and viral pericarditis, the aim of treatment is the resolution of pain and inflammation. For other etiologies of acute pericarditis treatment of the underlying disease is the mainstay of therapy.12,14 Combination therapy with colchicine and nonsteroidal anti-inflammatory drugs (NSAIDs) is recommended. Ibuprofen 600 mg or indomethacin 50 mg every 8 hours for one to two weeks followed by a gradual taper until resolution of symptoms and inflammatory markers, in combination with colchicine 0.6 mg twice daily (0.6 mg once daily if <70 kg) for 3 months is our standard recommendation. Non-aspirin NSAIDs are contraindicated in the early period (<7–10 days) after MI (can predispose to cardiac rupture), and aspirin should be used instead (650–1,000 mg three times daily). Due to the risk of gastrointestinal toxicity, addition of gastrointestinal protection with a proton pump inhibitor is recommended in higher risk patient. The randomized, open-label COPE (COlchicine for Acute PEricarditis) trial found that colchicine, in addition to aspirin, reduced the recurrence of pericarditis from 32.3% to 10.7% (P = 0.003).15 In the more recent randomized, double-blinded, placebo-controlled ICAP (Investigation on Colchicine for Acute Pericarditis) trial, a similar reduction in recurrent pericarditis was observed when colchicine was added to aspirin monotherapy (from 37.5% to 16.7%, P < 0.001). Unless their use is mandatory, anticoagulants should be avoided during the acute phase of pericarditis to reduce the risks of intra-pericardial bleeding and tamponade. Treatment with glucocorticoids should only be considered in recurrent pericarditis for patients with symptoms refractory to standard therapy, or in immune-mediated or uremic pericarditis.16 Use of steroids in acute pericarditis has been associated with recurrence.17 The correct dosing for steroid therapy remains controversial; however, our practice it to being with approximately 0.5 mg/kg/day with a prolonged and slow taper. As with non-aspirin NSAIDs, steroids should be avoided in post-MI pericarditis due to their impairment of scar formation and a consequently increased incidence of myocardial wall rupture. 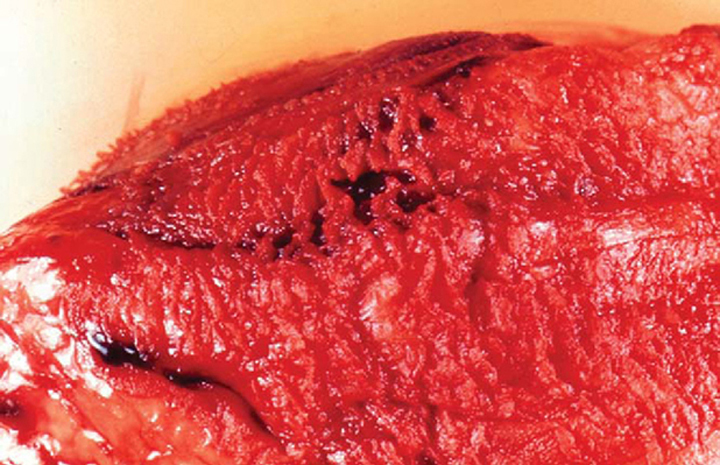 Pericardiectomy is not indicated in the management of acute pericarditis. Patients with uncomplicated acute pericarditis should have regular follow-up after the initial visit to ensure resolution of symptoms and rule out the development of constrictive symptoms. Pericardial effusion is defined as an increased amount of pericardial fluid. The pericardial sac normally contains up to 50 mL of fluid; it can hold 80 to 200 mL of fluid acutely, and even up to 2 L if the fluid accumulates slowly. Pericardial effusions may be asymptomatic unless associated with inflammation or tamponade physiology. Other symptoms arise from the compression of surrounding structures (lung, stomach, phrenic nerve) or diastolic heart failure and include chest pressure or pain, dyspnea, nausea, abdominal fullness, and dysphagia. Phrenic nerve irritation can cause hiccups. With a small effusion, the physical examination is unremarkable. 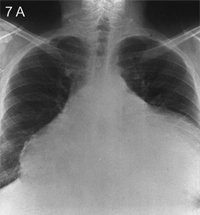 Larger effusions cause muffled heart sounds and, rarely, Ewart's sign (dullness to percussion, bronchial breath sounds, and egophony below the angle of the left scapula). 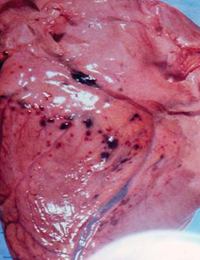 Low voltage and electrical alternans (Figure 9) may be seen if the effusion is large — the former due to increased distance from the chest leads, the latter caused by swinging of the heart within the effusion. These features in combination with sinus tachycardia should raise concern regarding the potential hemodynamic impact of the effusion and urgent assessment for tamponade physiology should be performed. Absence of hypotension should not dissuade the clinician from a possible diagnosis of pericardial effusion and tamponade, because hemodynamic instability usually does not occur until the patient nears circulatory collapse. 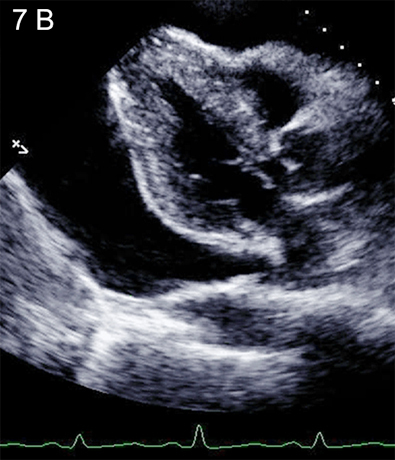 Echocardiography is the main diagnostic tool used in the evaluation of pericardial effusion. A pericardial effusion causes an echo-free space between visceral and parietal pericardium; the extent of the space defines the size of the effusion (Table 3). 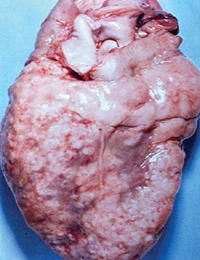 Large effusions can produce the picture of a swinging heart. 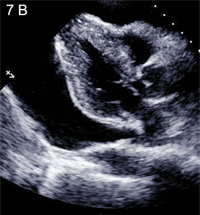 Although echocardiography is the imaging modality of choice for diagnosing a pericardial effusion, small loculated effusions pose a greater diagnostic challenge. If there is a high level of clinical suspicion of a pericardial effusion and the TTE is nondiagnostic, alternative tomographic imaging should be considered. This is especially true for patients who have recently undergone open heart surgery, who frequently have echocardiographic studies with suboptimal imaging quality, and effusions which may be loculated and complex. Cardiac CT and MRI will also aid in differentiating an effusion from pericardial fat, pericardial cysts and pleural effusions, all of which can mimic a pericardial effusion. Laboratory analysis in a patient with a pericardial effusion should include a complete blood count, chemistry panel, and erythrocyte sedimentation rate. Further testing should be done according to clinical suspicion. The medical management of pericardial effusion is based on treating the underlying cause. Effusions causing pretamponade or tamponade require immediate drainage. Volume expansion and inotropic support may be used for hemodynamic stabilization pending drainage. In the immediate postoperative setting, surgical management and open drainage are preferred because of the high incidence of loculated effusions. Anti-coagulation should be avoided if possible. Pericardiocentesis should be performed for diagnostic purposes if the cause of the effusion is unclear, or if malignancy or a purulent effusion is suspected. Therapeutic pericardiocentesis should be performed for effusions amenable to percutaneous drainage that are causing pretamponade or tamponade physiology. Subxiphoid pericardiostomy, also known as a pericardial window, may be done under local anesthesia. It has a high success rate, with few complications, and recurrence of fluid accumulation is rare. 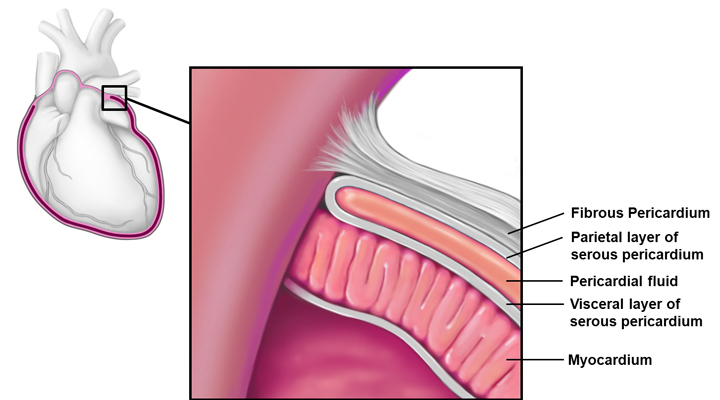 Percutaneous balloon pericardiotomy is the least invasive of the surgical procedures. It is used primarily as palliative treatment for neoplastic effusions with a poor prognosis. The success rate for relieving reaccumulation of pericardial fluid is 85% to 92% at 30 days. It may be performed in the catheterization laboratory under fluoroscopy using a balloon-dilating catheter. After drainage, follow-up echocardiography should be performed in all patients to rule out reaccumulation and/or constrictive physiology. Cardiac tamponade occurs when fluid accumulation in the finite serous pericardial space causes an increase in pressure, with subsequent cardiac compression and hemodynamic compromise. Symptoms resulting from decreased cardiac output and congestion include dyspnea, chest discomfort, weakness, restlessness, agitation, drowsiness, oliguria, and anorexia. If the tamponade develops acutely as a complication of an acute MI (free wall rupture) or trauma, the presentation is usually catastrophic, with shock or sudden death. The diagnosis of cardiac tamponade is a clinical diagnosis with echocardiagraphic comfirmation. The ECG may be unremarkable. 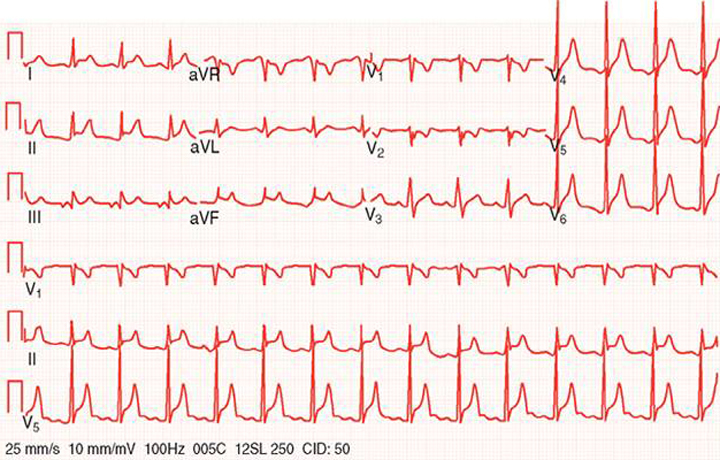 Abnormal findings on ECG include tachycardia, electrical alternans (Figure 9), low voltage, and may include changes associated with acute pericarditis (Figure 6). The most typical finding on right heart catheterization is equalization of mean right atrial, right ventricular and pulmonary artery diastolic, and mean pulmonary capillary wedge pressures. The symptoms of pericardial tamponade can mimic those of right-sided heart failure, right ventricular infarction, constrictive pericarditis, and pulmonary embolism. However, with the use of echocardiography and occasionally right heart catheterization, these may be distinguished. Patients with pretamponade and tamponade require immediate hospital admission and prompt pericardial drainage by pericardiocentesis. The drain catheter may be left in place for up to 48 hours if drainage is slow or reaccumulation likely. If follow-up echocardiography documents fluid reaccumulation, a pericardial window should be considered, because the infection risk associated with a pericardial drain increases after 48 hours.19 Pending drainage, intravenous fluid expansion and inotropic support may be used for hemodynamically unstable patients. Constrictive pericarditis refers to an abnormal scarring and loss of elasticity of the pericardium, resulting in impaired ventricular filling and decreased cardiac output. The frequency of different causes of constrictive pericarditis depends on the population and geography in question. In developed countries, cardiac surgery and idiopathic constriction are the leading cause, while in certain developing countries tuberculous remains the number one etiology. The initiating event results in a chronic inflammatory pericardial process, resulting in fibrinous scarring and occasionally calcification of the pericardium (Figure 10). As the heart becomes encased with a non-compliant pericardium, ventricular interdependance and dissociation between the intrathoracic and intracardiac pressure occurs. In constriction, normal expansion of the right heart is restricted by the pericardium and the septum shifts to the left to accommodate the increase in venous return with inspiration; the opposite movement occurs with expiration. Normally, there is a reduction in intrathoracic and intracardiac pressure with inspiration. The rigid pericardium impedes normal ventricular expansion and therefore venous return and pulmonary venous pressure. Because intrathoracic pressure drops but left ventricular pressure does not decrease with inspiration there is a reduction in the transpulmonary gradient. This leads to impaired ventricular filling and decreased cardiac output. Ultimately, right and then left ventricular heart failure develop. Distinguishing heart failure caused by constrictive physiology from diastolic restrictive physiology is a classic diagnostic dilemma. Symptoms are often vague and their onset is insidious; they include malaise, fatigue, and decreased exercise tolerance. With progression of constrictive pericarditis, symptoms of right-sided heart failure (eg, peripheral edema, nausea, abdominal discomfort, ascites) become apparent and usually precede signs of left-sided failure (eg, exertional dyspnea, orthopnea, paroxysmal nocturnal dyspnea). Increased ventricular filling pressures cause jugular venous distention and Kussmaul's sign (paradoxical rise in jugular venous pressure on inspiration), which is sensitive but not specific for constrictive pericarditis.23 Auscultation may reveal muffled heart sounds and occasionally a characteristic pericardial knock (60–200 msec after the second heart sound), which is caused by sudden termination of ventricular inflow by the encasing pericardium. Constrictive effusive pericarditis consists of a tense pericardial effusion in the presence of pericardial constriction, and both tamponade and constrictive signs and symptoms are present. The ECG does not show specific findings, but low voltage may be seen. 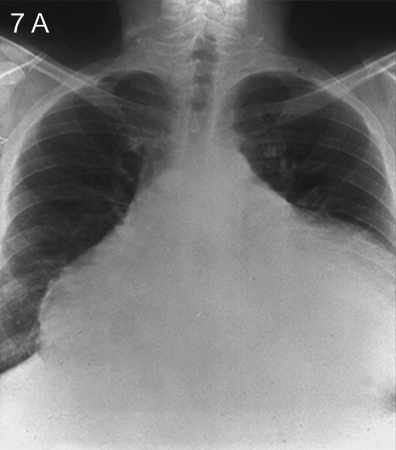 Pericardial calcifications (Figure 10), pleural effusions, and biatrial enlargement may be noted on the chest radiograph. Direct pressure measurements are performed if there is doubt about the diagnosis. Characteristic features in the right atrium include: elevated right atrial pressures, prominent x and y decents and Kussmaul's sign. Square-root or dip-and-plateau right ventricular pressure waveforms reflect impaired ventricular filling. Because of the fixed and limited space within the stiff pericardium, end-diastolic pressure equalization (typically within 5 mmHg) occurs between these cardiac chambers. Pulmonary artery systolic pressures are usually normal in pericardial constriction; higher pulmonary pressures suggest a restrictive cardiomyopathy. 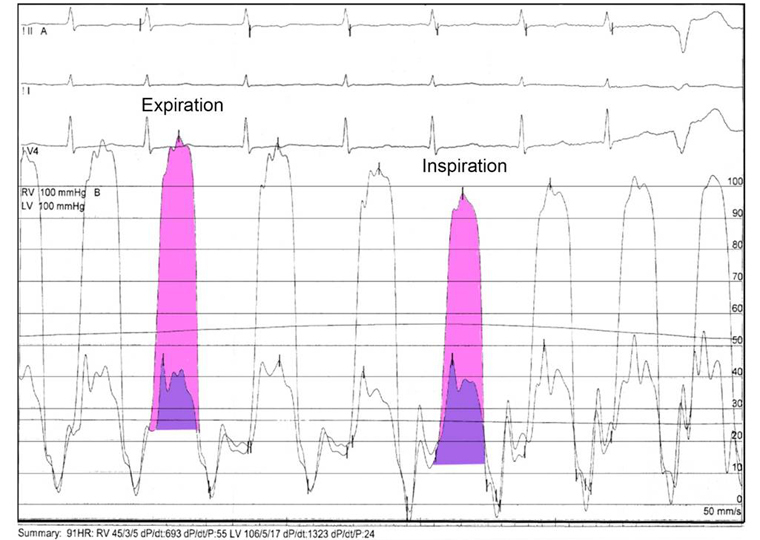 The ratio of the right ventricular to left ventricular systolic pressure-time area during inspiration compared to expiration is a highly sensitive and specific means of differentiating constriction from restriction (Figure 11). 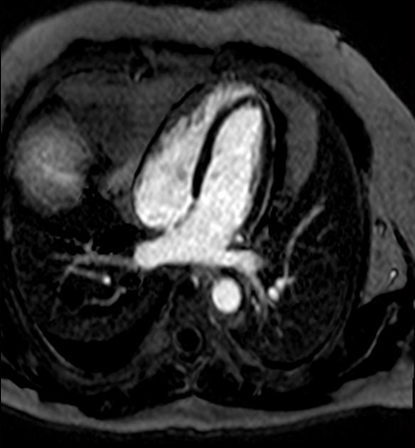 Computed tomography is the imaging modality of choice to evaluate the thickness of the pericardium and for pericardial calcification. Although the finding of thickened pericardium on CT is specific for constriction, up to 18% of patients with constriction confirmed by other modalities do not have pericardial thickening.26 Computed tomography can also assist surgical planning. Medical treatment is limited in chronic constrictive pericarditis in the absence of active inflammation. Diuretics and a low-sodium diet may be tried for patients with mild to moderate (New York Heart Association Class I or II) heart failure symptoms or contraindications to surgery.14 For patients that do not respond to medical treatment, pericardiectomy is advised. Acute pericarditis manifests with acute positional and pleuritic chest pain, ECG changes, is sometimes accompanied by a pericardial rub, and is often associated with pericardial effusion. In the United States, 90% of cases of acute pericarditis are idiopathic. Non-aspirin NSAIDs and colchicine should be used for most patients, except for those with post-MI pericarditis (they should receive aspirin and colchicine). Colchicine reduces the recurrence of pericarditis. Steroids can increase the recurrence rate of pericarditis and the risk of acute myocardial rupture. They should be reserved for cases where steroids are indicated to treat the underlying cause of the effusion, or for recurrent/resistant pericarditis. There are a wide range of medical conditions that can precipitate a pericardial effusion; the etiology can often be deduced from the clinical presentation. In the absence of hemodynamic compromise, treatment of the underlying medical condition is indicated. Cardiac tamponade is a clinical diagnosis made by documenting one or more of the following in the presence of a pericardial effusion: tachycardia, pulsus paradoxus (>10 mmHg inspiratory decline in systolic BP), jugular venous distention, and muffled heart sounds. The signs depend on the volume of fluid in the pericardial sac and the rate at which the fluid accumulates. Echocardiography can confirm the diagnosis at an early stage and help with the drainage of the effusion. Pericardiocentesis should be performed for diagnostic purposes if the cause is unclear or if purulent infection is suspected. Therapeutic pericardiocentesis should be performed if there is evidence of hemodynamic compromise. Constrictive pericarditis results from an abnormal scarring of the pericardium that causes impairment of diastolic filling. A diagnostic challenge often lies in differentiating constriction from restriction. The diagnosis can be made by noting hemodynamic derangements on echocardiography/CMR/right heart catheterization and a thickening of the pericardium on echo/CT/MRI. About 20% of patients do not demonstrate thickening of the pericardium by CT.
For patients that do not respond to medical therapy, the treatment of choice is surgical excision of the pericardium. Blanchard DG. Pericardial effusion and AIDS. Circulation 1996; 94:2312. Lange RA, Hillis LD. Clinical practice. Acute pericarditis. N Engl J Med 2004; 351:2195–2202. Zipes DP, Libby P, Bonow RO, Braunwald E, eds. Braunwald's Heart Disease A Textbook of Cardiovascular Medicine. 7th ed. Philadelphia, PA: Elsevier Saunders; 2005. Klein AL, Abbara S, Agler DA, et al. American Society of Echocardiography clinical recommendations for multimodality cardiovascular imaging of patients with pericardial disease: endorsed by the Society for Cardiovascular Magnetic Resonance and Society of Cardiovascular Computed Tomography. 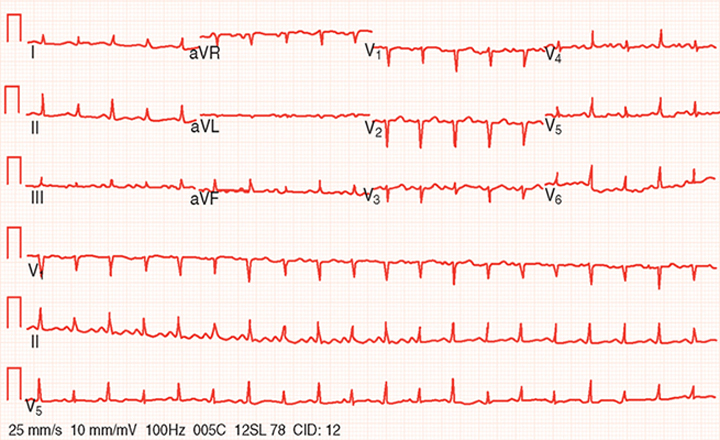 J Am Soc Echocardiogr 2013; 26:965–1012.e15. LeWinter MM. Pericardial diseases. In: Libby P, Bonow RO, Mann DL, Zipes DP, eds. Braunwald's Heart Disease: A Textbook of Cardiovascular Medicine, Single Volume. 8th ed. Philadelphia, PA: Saunders; 2007:1829–1853. Meyers DG, Meyers RE, Prendergast TW. The usefulness of diagnostic tests on pericardial fluid. Chest 1997; 111:1213–1221. Fowler NO, Tuberculous pericarditis. JAMA 1991; 266:99–103. Rostand SG, Rutsky EA. Pericarditis in end-stage renal disease. Cardiol Clin 1990; 8:701–707. Wood JE, Mahnensmith RL. Pericarditis associated with renal failure: evolution and management. Semin Dial 2001; 14: p. 61–66. Sugiura T, Iwasaka T, Takayama Y, et al. Factors associated with pericardial effusion in acute Q wave myocardial infarction. Circulation 1990; 81:477–481. Oliva PB, Hammill SC, Edwards WD. Electrocardiographic diagnosis of postinfarction regional pericarditis. Ancillary observations regarding the effect of reperfusion on the rapidity and amplitude of T wave inversion after acute myocardial infarction. Circulation 1993; 88:896–904. Khan AH. The postcardiac injury syndromes. Clin Cardiol 1992; 15:67–72. Bogaert J, Francone M. Pericardial disease: value of CT and MR imaging. Radiology 2013; 267:340–356. Imazio M, Spodick DH, Brucato A, Trinchero R, Adler Y. Controversial issues in the management of pericardial diseases. Circulation 2010; 121:916–928. Imazio M, Brucato A, Mayosi BM, et al. Medical therapy of pericardial diseases: part I: idiopathic and infectious pericarditis. J Cardiovasc Med (Hagerstown) 2010; 11:712–722. Taylor AM, Dymarkowski S, Verbeken EK, Bogaert J. Detection of pericardial inflammation with late-enhancement cardiac magnetic resonance imaging: initial results. Eur Radiol 2006; 16:569–574. Imazio M, Brucato A, Mayosi BM, et al. Medical therapy of pericardial diseases: part II: noninfectious pericarditis, pericardial effusion and constrictive pericarditis. J Cardiovasc Med (Hagerstown) 2010; 11:785–794. Imazio M, Bobbio M, Cecchi E, et al. Colchicine in addition to conventional therapy for acute pericarditis: results of the COlchicine for acute PEricarditis (COPE) trial. Circulation 2005; 112:2012–2016. Maisch B, Seferović PM, Ristić AD, et al. Guidelines on the diagnosis and management of pericardial diseases executive summary; the task force on the diagnosis and management of pericardial diseases of the European Society of Cardiology. Eur Heart J 2004; 25:587–610. Lotrionte M, Biondi-Zoccai G, Imazio M, et al. International collaborative systematic review of controlled clinical trials on pharmacologic treatments for acute pericarditis and its recurrences. Am Heart J 2010; 160:662–670. Sagristà-Sauleda J, Mercé AS, Soler-Soler J. Diagnosis and management of pericardial effusion. World J Cardiol 2011; 3:135–143. Imazio M, Adler Y. Management of pericardial effusion. Eur Heart J 2013; 34:1186–1197. Dunn PM, MacNichol J, Krekeler MM, Rotter SM, Brown K. Roentgenograms in pericardial effusion. JAMA 1987; 258:1890–1891. Corey GR, Campbell PT, Van Trigt P, et al. Etiology of large pericardial effusions. Am J Med 1993; 95:209–213. Curtiss EI, Reddy PS, Uretsky BF, Cecchetti AA. Pulsus paradoxus: definition and relation to the severity of cardiac tamponade. Am Heart J 1988; 115:391–398. Bilchick KC, Wise RA. Paradoxical physical findings described by Kussmaul: pulsus paradoxus and Kussmaul's sign. Lancet 2002; 359:1940–1942. Leya FS, Arab D, Joyal D, et al. The efficacy of brain natriuretic peptide levels in differentiating constrictive pericarditis from restrictive cardiomyopathy. J Am Coll Cardiol 2005; 45:1900–1902. Kusunose K, Dahiya A, Popović ZB, et al. Biventricular mechanics in constrictive pericarditis comparison with restrictive cardiomyopathy and impact of pericardiectomy. Circ Cardiovasc Imaging 2013; 6:399–406. Talreja DR, Edwards WD, Danielson GK, et al. 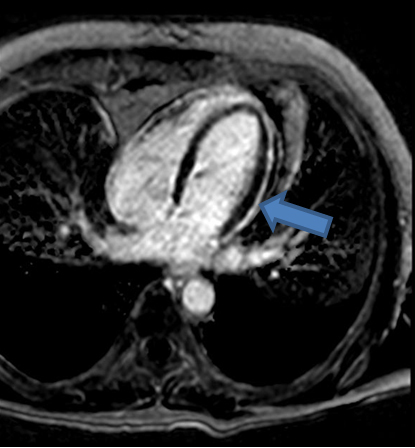 Constrictive pericarditis in 26 patients with histologically normal pericardial thickness. Circulation 2003; 108:1852–1857. Feng D, Glockner J, Kim K, et al. Cardiac magnetic resonance imaging pericardial late gadolinium enhancement and elevated inflammatory markers can predict the reversibility of constrictive pericarditis after antiinflammatory medical therapy: a pilot study. Circulation 2011; 124:1830–1837. Sagristà-Sauleda J, Permanyer-Miralda G, Candell-Riera J, Angel J, Soler-Soler J. Transient cardiac constriction: an unrecognized pattern of evolution in effusive acute idiopathic pericarditis. Am J Cardiol 1987; 59:961–966. Syed FF, Ntsekhe M, Mayosi BM, Oh JK. Effusive-constrictive pericarditis. Heart Fail Rev 2013.; 18:277–287. Szabó G, Schmack B, Bulut C, et al. Constrictive pericarditis: risks, aetiologies and outcomes after total pericardiectomy: 24 years of experience. Eur J Cardiothorac Surg 2013; 44:1023–1028; discussion 1028. Haley JH, Tajik AJ, Danielson GK, Schaff HV, Mulvagh SL, Oh JK. Transient constrictive pericarditis: causes and natural history. J Am Coll Cardiol 2004;271–275.